We have been working on a 4-color processing project to supply and print labels for Keomi Skincare. They make a line of Organic, All natural, soap and soap care products. 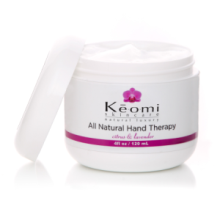 In addition they have hand lotion products for Men and Women. We are working on printing labels for 2 sizes of jars and 2 sizes of bottles. We have found a source of pre-cut labels that will enable us to do short run four-color processing labels in different sizes and shapes. Good until March 31st, 2015. If you would like more information about how to custom order your own business label needs, contact us. 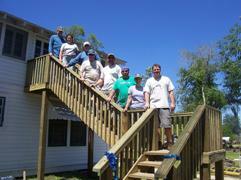 Laguna Coast employees have taken many trips to New Orleans and Mississippi to do Katrina relief work. From building storage pods, gutting homes, rebuilding homes, cleaning up and more. They volunteer and pay their own way. Pictured to the left is team that built a set of stairs for a couple that was flooded up to the top of their beds on the second floor with no way out. We are registered with the Women’s Business Enterprise National Council. This certification affirms the business is women-owned, operated and controlled. Laguna Coast has been in business for 33 years and woman owned for over 15 years.